Before people decide to eat at a restaurant, they usually read the menu first. A beautiful menu with a fresh design can make your dishes all the more appetizing. The problem? Most restaurants, catering businesses, and cafes are working within a tight budget. But that doesn't mean you have to sacrifice the quality of your menus. 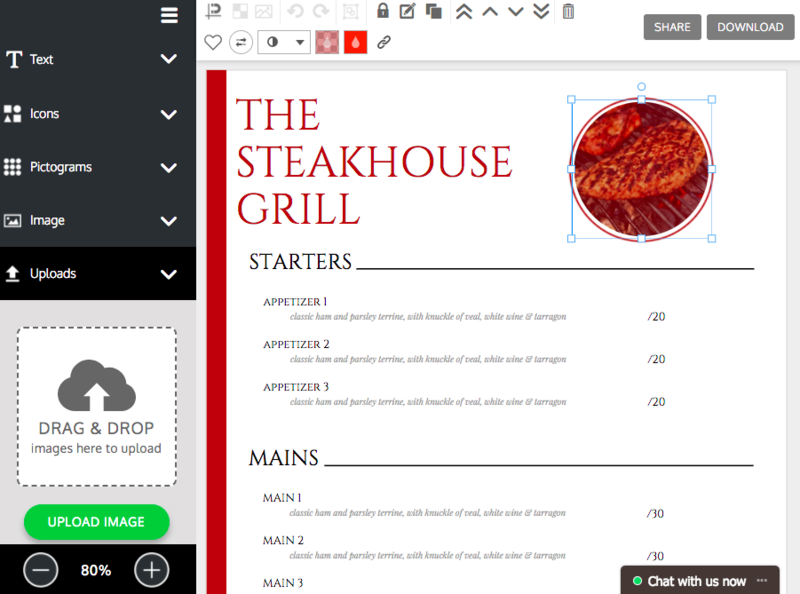 Venngage's menu templates make it easy to create menus for any type of restaurant. 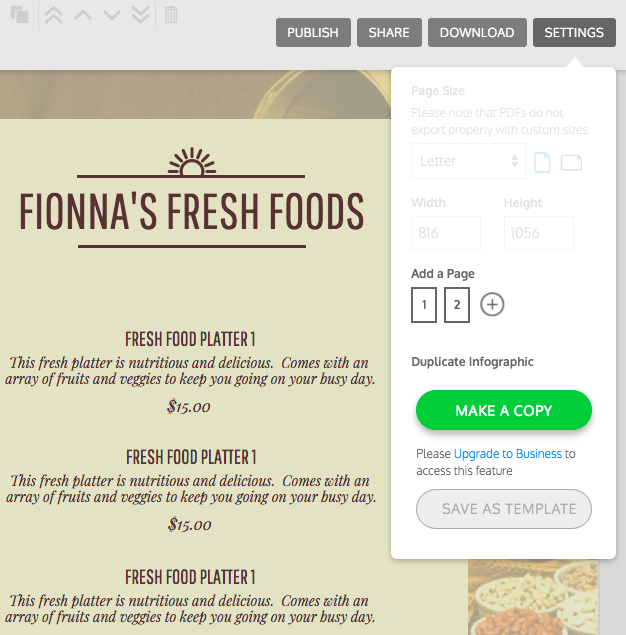 Pick a template with a theme and layout that fits your restaurant. Insert your own dishes and customize the design to fit your business. Voila - a menu that hungry patrons will pour over. Sign up for Venngage for free. Pick a menu template that fits your menu selection. 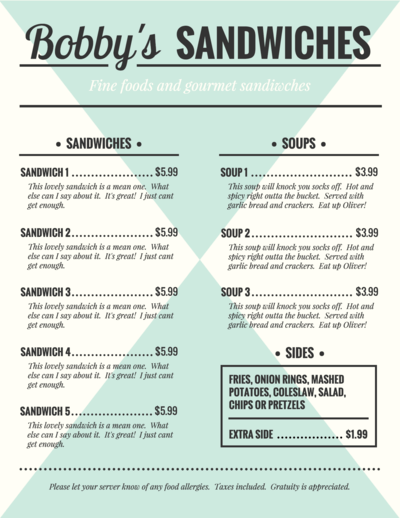 Personalize your menu text and design. Season your menu design with beautiful images and decorative fonts. 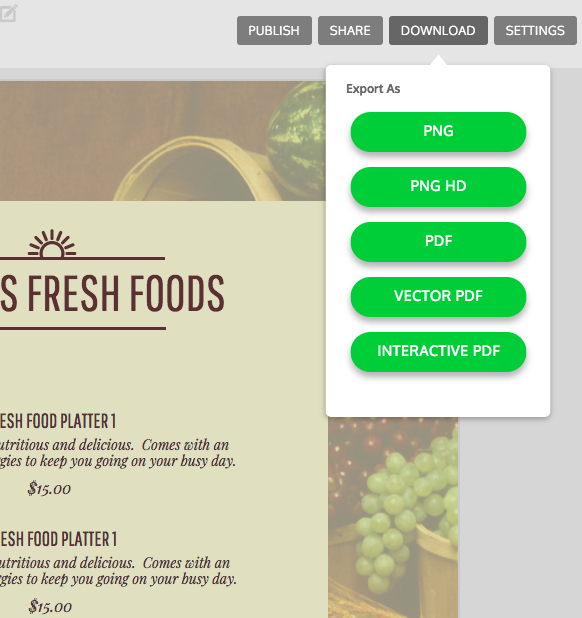 Download your menu as a high quality PNG or PDF. How do you want your restaurant to appear on the page? 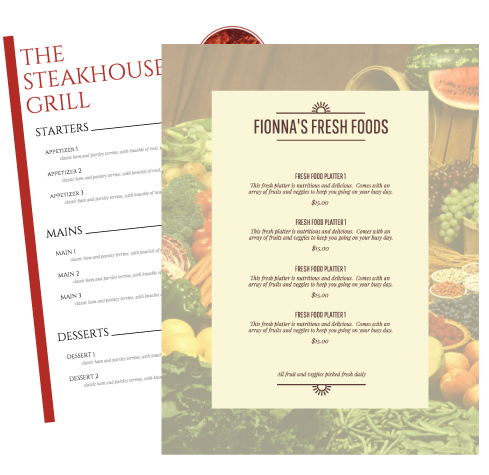 Look for a menu template that will tell your readers the story of your restaurant. Browse Venngage's font library for fonts that will grab readers' attention and make your tasty descriptions jump off the page. Showcase the wholesome ingredients that go into your food, the special region your food is inspired by, or show the dishes themselves. 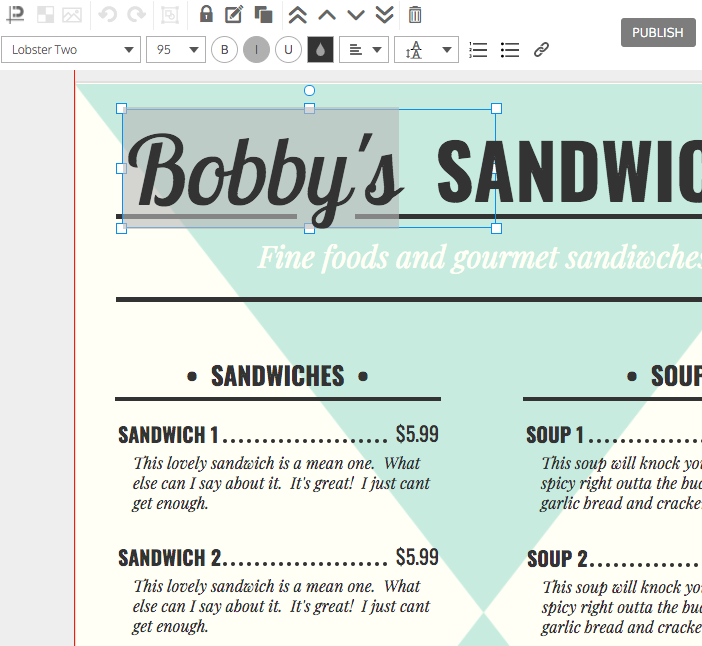 Add bright borders, titles, and illustrations to make your menu engaging. Do you want readers to feel like they've just stepped off the red carpet and into your restaurant? Or do you want them to feel like they're sitting down at their grandma's table? 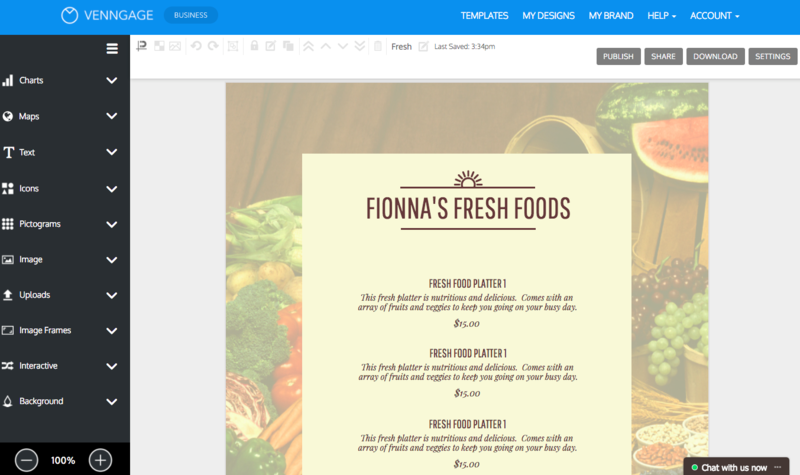 Venngage offers a variety of menu templates for all sorts of culinary stories. Each template is professionally designed and ready to use as is. Just replace the text placeholders with your own text and you're ready to go! If you do want to take more creative freedom, you can also customize your menu as much as you want using our simple drag and drop canvas. What is your food trying to say to people? Settle down for a comforting meal? Or impress your guests with our trendy fare? 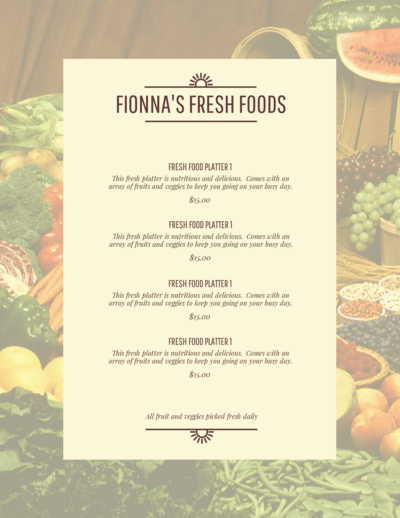 The fonts you use in your menu will speak to the theme and mood of your business. Venngage's font library offers a wide variety of different font styles. Pick from scrawling script fonts to fun quirky fonts, to sleek modern sans serif fonts. Pictures are an essential part of storytelling - especially where food is concerned. Venngage gives you the freedom to upload your own images and save them to your image library to use again later. Our handy image frame feature helps you incorporate your visuals seamlessly into your design. Got more foodie goodness than can be contained on one page? 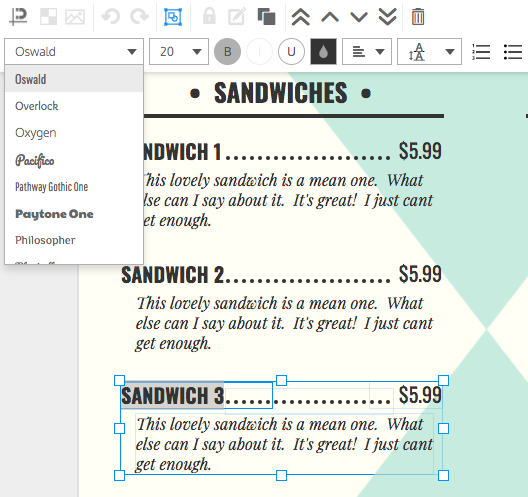 Create menus with multiple pages using our multi-page feature. Copy, add, delete, and rearrange menu pages. Venngage's drag-and-drop canvas makes it easy to modify templates to fit your specific needs. If you don't have your own images, Venngage offers an image library containing thousands of free stock photos. Download your menu as a high quality PNG or PDF, or share your menu on social media directly from Venngage in just a few clicks. You can sign up with your email, Facebook or Gmail account. Can I edit my menu after I've exported it? Yes, you can access your design at any time and make changes by selecting it in your design library. Any edits you make to the design are autosaved. Can I print out my menu? Yes! 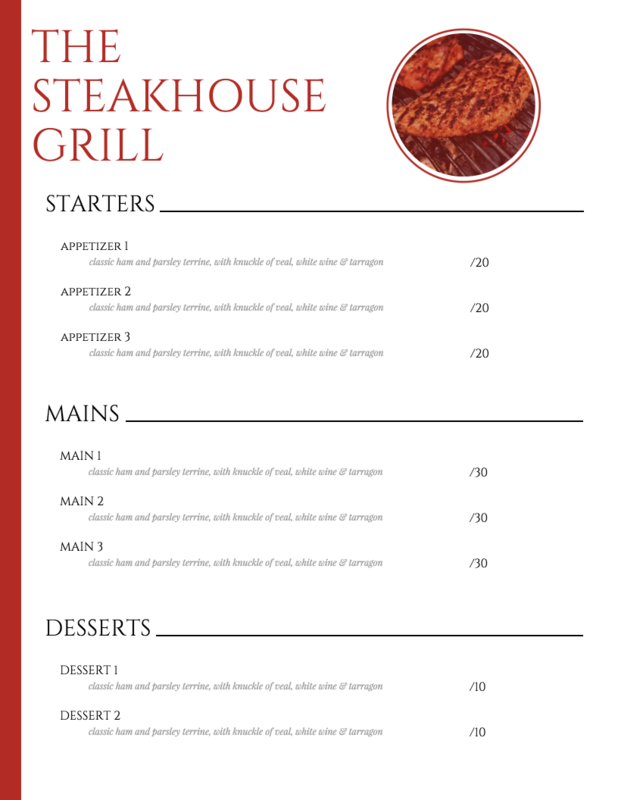 You can download your menu as a high quality PNG or multi-page PDF. Check out Venngage's templates library for more menu templates.